Today, GoPro announced that it was working on an array that combines six GoPro Hero cameras for spherical shots all at once. CEO Nick Woodman says that when Facebook bought Oculus, the ‘gauntlet was dropped’ and GoPro started work on a spherical setup that could generate content for virtual reality and augmented reality systems. Woodman also said that the company has software in ‘alpha’ right now inside the company that allows users to auto-sync their GoPro cameras to the cloud so they can access their footage. This is still in the ‘early stages,’ Woodman said, but this would theoretically allow people to view and edit without ever “having to touch an SD card or touch a USB cord. The company is also working on a quadcopter drone for aerial photography using GoPro cameras. “It seemed natural to us that we’re in the GoPro enabling business and drones are the ultimate GoPro accessory…that was all the rationale we needed to say OK. It’s core enough to our business to make sense to make our own,” says Woodman. He noted that GoPro cameras would also remain compatible with other drones. Drone videography with GoPro cameras has become de rigueur for everything from extreme sports to weddings. So it makes a lot of sense for GoPro to buy into the business on their own. The WSJ reported recently that the company was looking to launch drones. Many GoPro users already attach their cameras to a variety of drones offered by third-party companies. Woodman didn’t reveal the pricing but said that it would be available in the second half of next year. The array will be available in the second half of 2015. “This is really going to be most appealing for production companies and prosumers,” said Woodman. He added that ‘normal’ people would definitely end up buying it but the first version would be for pros. GoPro envisions this mount capturing video for VR and AR systems such as Oculus, HoloLens, Cardboard and YouTube 360 videos. Woodman quoted the price of the current 6-camera unit as ‘DSLR-class’, so in the $1,500-$2,000 range perhaps. There have been other attempts at doing this from third parties — there’s a model on Shapeways, for instance, that allows the mounting of 6 cameras. GoPro quickly embraced virtual reality content likely in a bid to secure its spot in the market as it did with action videos. Last month the company announced the acquisition of Kolor, which builds software for virtual reality and the processing of spherical video. 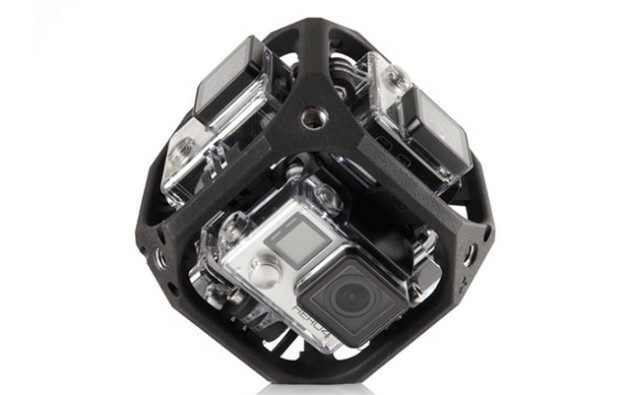 At the time Woodman stated that with his company’s cameras and Kolor’s software, GoPro will be able to provide a solution for capturing, creating and sharing spherical content. Woodman was interviewed today at the Code conference in California. GoPro has become inextricably intertwined with the rise of extreme sports, but its rugged cameras are used for a variety of things outside of skydiving and motocross. As many of our devices have strived for thinness and technical superiority above all else, they have become increasingly pervious to the elements. GoPro, with its blocky but durable units, has become the go-to for any situation where you wouldn’t want to risk the family camera or smartphone, but you really still want video. Woodman started the company in 2004 by selling shell belts out of the back of his van and taking an angel investment of $230,000 from his parents and has grown it to a business worth over $7B. He was the highest paid CEO in 2014, due to stock grants worth $285M. These days, GoPro, which sparked the entire ‘action camera’ economy, is beset on all sides by less expensive imitations like Xiaomi’s ‘Yi Camera’ — and a recent Apple action camera patent filing caused its stock to drop $13 in a single day (it’s currently hovering around $50). Woodman has been in the headlines recently for giving up $229M worth of shares to fulfill a verbal promise made to a college roommate 10 years ago when he was getting the business running.